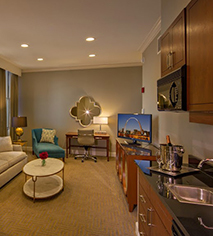 Situated on the top floor of the Hilton St. Louis Downtown at the Arch, the Presidential Suite boasts an expansive 700 sq ft of comfortable space. 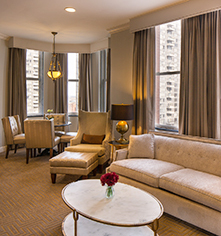 Guests of the suite can enjoy the luxuries of a kitchenette with a table and seating for four, two full bathrooms with the master bath offering a walk-in tile European style shower, and beautiful views of 4th and Olive Streets. Ideal for entertaining, the suite includes a large living area with a couch, two chairs with ottomans, and a a 52-inch television. 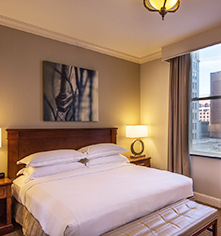 In addition to the master bedroom that consists of one king-size bed, the Presidential Suite is conveniently adjoined to another King Room.